If you have been following this series, you already know about Bob Garrett and other volunteers from key chapters who formed the ground work for the TLCA. You have read a detailed history about Toyota Trails and its rise to fame as the association’s award winning premier color publication. Now I want to spend some time sharing historical information about TLCA events, their hosting clubs and how they helped launch the association. As previously noted, the Toyota Land Cruiser Association was built upon the shoulders of existing Land Cruiser and Toyota based clubs. Specifically TLCA Ventura, TLCA Madera, TLCA San Fernando, TLCA Los Angeles County, High and Dry Four Wheelers, Crazy Eights, Toys on the Rocks and Mountain Transit Authority. Thanks to the efforts of Bob Garrett and Mike Bennett, we have recreated Chapter Spotlights for the now defunct TLCA Ventura and TLCA Madera Chapters. These should provide excellent insight into the roots of these key TLCA Chapter clubs that helped form the foundation of the association. I also want to note that while these clubs are no longer active, their members are still around the Land Cruiser community, still own their Cruisers or mini trucks, and probably still wear their club colors on special occasions. 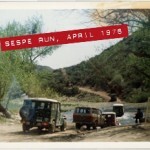 Before TLCA even came to be, various members including George Rice and John Fulton (along with their families and many other club members) began venturing out to Death Valley or Lone Pine, California, in late November of 1976 for a club run. 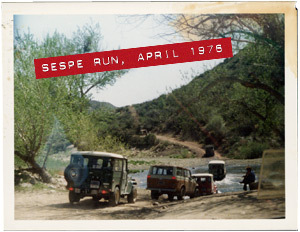 The terrain was challenging for their highly modified Land Cruisers (31″ tires, shackle lift for height and some even had cutting edge technology like an SM420 transmission or even a rear locker!) and sometimes the weather was challenging, allowing for many great stories to be told over the course of the following year. As the next year progressed, excitement would grow during the planning stages, and again in November the clubs would journey out to a new location or back to a previous location to host their club event. 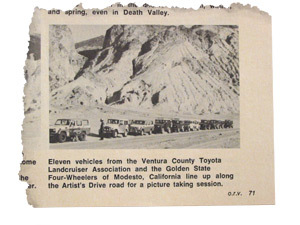 Other Land Cruiser owners from clubs such as Madera County, Los Angeles County, San Fernando and Crazy Eights would join in the fun based upon word of mouth or knowing someone in the Ventura Club. Eventually this November run cemented a place in the TLCA calendar and the name Thanksgiving Day Run was easily given based upon the November weekend it routinely fell upon. Thus was born the Thanksgiving Day Run and I personally believe a lot of discussion and strategizing about the future association of Land Cruiser clubs went on during the first couple of years around the campfire at this event. 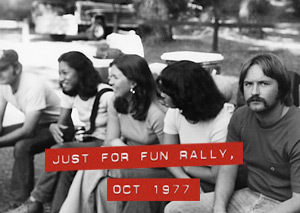 In 1980 when Morey Estrada of TLCA Madera took over as TLCA President, and the association’s new newsletter, Toyota Trails, was just beginning, the Fourth Annual Thanksgiving Day run had secured its place on the calendar and auspiciously became the young association’s first and only official run. The Thanksgiving Day run began playing a huge role for the association almost immediately. It provided the opportunity for Toyota owners to gather and meet. 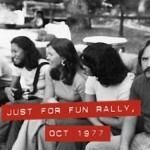 It later allowed the young association to market itself and gain new Chapters. Remember, there was no internet at the time and the association was not large enough to draw the attention of the 4×4 magazines. The Thanksgiving Day run provided the marketing opportunity to draw in new members and ideally their club’s involvement as a Chapter. It helped to develop some working capital which the young association could leverage into more marketing avenues such as stickers and membership cards. But most importantly, it allowed members and their families to meet and have fun with their beloved vehicle of choice, and it catered specifically to the Toyota Land Cruiser, something that was virtually non existent at the time. and hosting was shared between the primary TLCA Chapters. Locations most often visited included Panamint Valley near Death Valley, Lone Pine, or a piece of private property owned by a TLCA member. 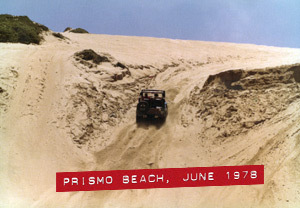 Later years saw the event also at Truck Haven OHV area near the Salton Sea in California. 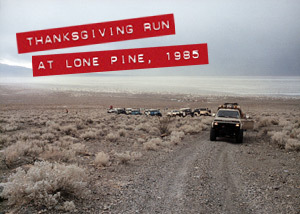 In 1984, when the association was struggling to stay afloat, the event was at Lone Pine, which is where Bob Garrett was heard to utter the phrase, “We could give this thing a go or have one hell of a party!” By the Thanksgiving Day Run’s tenth showing in 1986, the association was raffling off a truck each year (the winning ticket was always chosen during the Thanksgiving event) and President Dan Schueler had the association on pace for phenomenal growth in the next 5 years. In that this was the association’s only formal event, it was a huge annual effort with regard to planning, host chapter, location, logistics, advertising and coverage in Toyota Trails. This continued effort and focus paid off big in 1989 with Off Road magazine giving the Thanksgiving Day run coverage. 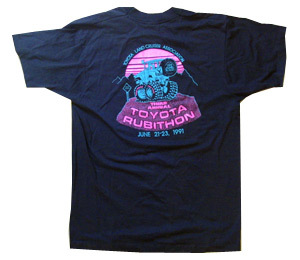 This coverage, coupled with magazine coverage of the association’s new Rubithon event in 1989 and 1990, along with Gary Bjork turning Toyota Trails into a premier publication, culminated in launching membership to new heights in the early 90s. 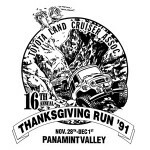 The Thanksgiving Day Run went on to be included in the top twenty events in the West, according to an Off Road magazine poll in 1995. By 1994, ten years after Bob Garrett questioned the future of his fledgling association, TLCA was poised to go national. As discussed previously, TLCA was very California based for much of its early years, and through many planned efforts including the NEC (National Expansion Committee) and the commercial magazine coverage, TLCA was gaining a national presence and new Chapters were springing up around the country. 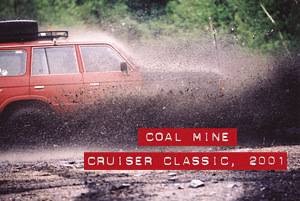 1992 and 1993 saw Chapters form including Beach-N-Toys, Coastal Cruisers, Washington Timber Toys, Basin and Range Cruisers, Massachusetts Coastal Transit Authority, Totally Land Cruisers of New Jersey, Mid-Ohio Land Cruisers, Greatland Polar Toys, and Toyotally Awesome Cruisers. 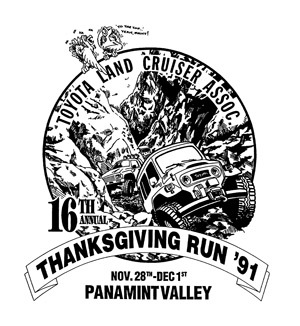 In 1996, just one year after the Thanksgiving Day Run was declared in the top twenty, Nevada based Southern Nevada Land Cruiser Association offered to host the Nineteenth Annual Thanksgiving Day Run in conjunction with their long time event, Glitter Gulch Gambol, mainly because no other chapter had stepped up to volunteer as host. In 1997, Ron Patston applauded the first TLCA Board of Directors with a national presence in his president’s column. Board Members hailed from all over, including the east coast, something that had never before been attained. These were glory days for the association with membership eclipsing 4,000 for the first time. But as I read through those issues of Toyota Trails from 1997 and interviewed key TLCA volunteers, something was missing. Gone was the Thanksgiving Day Run. While the association had achieved a long term goal of breaking free of its California borders and had become a national association with coast to coast representation, the stalwart Thanksgiving Day run had met its demise. Twenty years had passed and new Chapters had replaced the original chapters in leading the association. Some like TLCA Madera and TLCA Los Angeles County had even undergone name changes. The yearly truck raffle and Member of the Year contest had also faded with time and were no longer supported. Other events had come onto the scene and the old Thanksgiving Day Run found itself abandoned and forgotten. Of all my research into the vast and diverse history of our association, I found the story of the Thanksgiving Day Run to be the most intriguing. 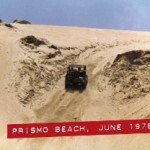 This highly publicized, very important and popular event, which filled the pages of Toyota Trails, saw key folks like Garrett, Estrada, Schueler and Bjork in attendance, hosted nearly every yearly truck raffle and was at one time voted one of the top twenty OHV events on the west coast…. Simply up and disappeared forever in 1997 when TLCA proclaimed success in going national. 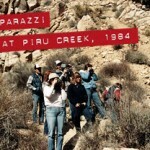 Sometime around 1987 or 1988, Mike Bennett joined many Toys on the Rocks members in attending their annual club sponsored run on the Rubicon trail, a run called Toyota Mountain Mania. Toys on the Rocks shared their event with all TLCA members via the calendar in Toyota Trails. Mike was so enthralled with the Rubicon trail that he felt TLCA would benefit from conducting a run on this world famous trail and in 1989, Mike, along with his club, TLCA Madera, successfully hosted the first Rubithon! Mike and fellow TLCA Madera member Dan Schueler named the event after a marathon. The truck count was extremely limited and the event, which ran Friday through Sunday, paled in comparison to the well established Thanksgiving Day Run, which was in its twelfth year. But Mike had the vision to realize that rock crawling was the future of organized events and the folks that attended returned home excited and plans immediately began for the second running of Rubithon. 1989 was a chaotic year for the association. Cindy Schueler was serving as managing editor for Toyota Trails and as Vice President of TLCA, and the workload was already too much when she took over the recently vacated post of President. Membership was climbing fast and new chapters abounded. One such Chapter, Bay Area Cruisers, based in the San Francisco Bay area, was new on the scene and a few members had attended the first Rubithon with Mike. This young, energetic group of Land Cruiser and mini truck owners immediately volunteered to chair the second Rubithon when TLCA called for volunteers. The planning effort went well and the event found nearly 27 trucks in attendance. However, despite the commercial magazines reporting that the event went well, and the association benefiting from the national coverage of their new event on this world famous trail, the real story has an ugly side. It turns out that many members in this new chapter talked a story that did not truly line up with their actions. A few members of this new chapter ended up having a bit too much fun and things turned sour one evening around the campfire as TLCA members from various chapters had to corral certain individuals and ask them to return to their tents and call it a night. Now obviously we are not going to name names here and frankly, it is all history now. But shortly after the event, the TLCA Board of Directors confirmed the integrity and mission statement of the relatively young association by tossing Bay Area Cruisers out of the association. Here was a chapter whose logo only appeared in one issue of Toyota Trails and they found themselves banned from the association. I believe sharing this story has relevance today in confirming that TLCA seeks to promote family oriented events, and only allows Chapters that are truly interested in responsible OHV activities. Despite the events that took place around the campfire in 1990, the second annual Rubithon was deemed a success and subsequent years continued to see growth in attendance. 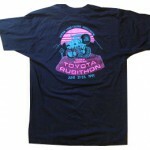 In 1989, Rubithon was TLCA’s second formal event, coupled with the long running Thanksgiving Day Run. Each year a chairman would work in conjunction with a hosting chapter or two, such as Toys on the Rocks or MTA, who played crucial roles throughout the history of Rubithon. Bruce Cotter (1993) and Gary Bjork (1994–1997) both served as Chairman before Mike Trathen (who had served as Tech Editor for Toyota Trails) took over and served as chairman from 1998 through 2002. From 1997, when the Thanksgiving Day Run disappeared, Rubithon remained (and continues today), as TLCA’s only Hosted event. In the early 1990s, when TLCA was pushing for a national presence, a club was formed in Tennessee specifically to become a TLCA chapter and more importantly, to host a Toyota specific event. These intrepid folks had learned of the association in the late 80s via the commercial magazine coverage and issues of Toyota Trails (which was still black and white with Craig Roberts and later Cindy Schueler as Editor). Thus was born the Southeast Toyota Land Cruiser Association (STLCA) in 1991 under the leadership of Bob Hollingsworth, Dwight Yokum and Rainey Kirk. At the time, everyone in the association realized that a TLCA specific event was sorely lacking on the East Coast and STLCA formed with a primary goal of hosting an annual event. Many in TLCA questioned the rationale and whether or not the Chapter would succeed, not only with hosting an event but simply holding together as a club. In 1992, with TLCA chapters at 15 and membership over 500, STLCA hosted the very successful Great Smoky Mountain Trail Ride (GSMTR, aka the Southeast Beast) with 39 trucks in attendance, including Toyota Trails Editor Gary Bjork, all the way from California. This was twice their estimated turnout, the reason being that GSTMR had coincided with a well established OHV event (eighteenth annual Smokey Mountain Trek), hosted by the Great Lakes Four Wheel Drive Association. Many Toyota owners who normally would not have heard about the new STLCA event were attending the GL4WD event. And as it turned out, STLCA did reschedule their event in the next two years to avoid the trail congestion caused by other events. GSMTR also posed a new challenge for the association whose membership was exploding. It was the first time an event was hosted specifically for TLCA and its members by a Chapter. 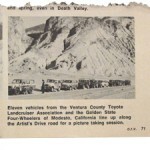 Mountain Transit Authority had been hosting its primary event, Mud-N-Yer Eye Frolic, since 1976, with lots of participation from TLCA (including fliers inserted directly into issues of Toyota Trails) and CA4WD association members. 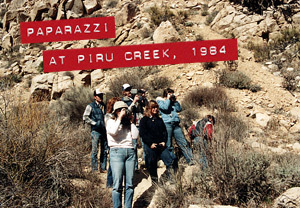 Southern Nevada Land Cruisers was hosting the sixteenth annual Glitter Gulch Gambol in 1992. With the success of GSMTR in providing the Eastern and Southern TLCA members an opportunity to attend a TLCA event, STLCA quickly decided to make GSMTR an annual event for 1993, and TLCA amended its bylaws to allow Sanctioned events. In March of 1993, the Frolic was hailed by TLCA President Scott Parks as a Sanctioned event, which included a one half page ad, and the eighteenth annual Gambol debuted as a Sanctioned event requiring TLCA membership of all attendees in 1994. While these two events were not formally sanctioned until 1993/1994, (Sanctioned did not exist prior to the 1993 bylaw changes brought forth by GSMTR), their history and that of their hosting chapter is intricately woven with TLCA. 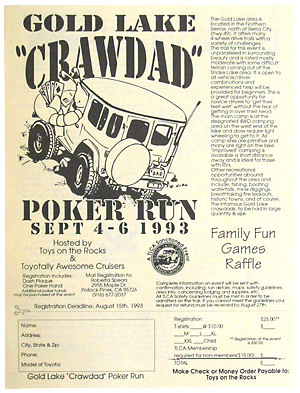 1993 also saw the first Crawdad Run at Gold Lake, California, hosted by Toys on the Rocks, which was initially called the Gold Lake Poker Run. This event took place in the Gold Lake Basin area in the northern Sierra Nevada mountains. Abundant with lakes, campgrounds and four wheel drive trails, the setting was a natural place to host an event. 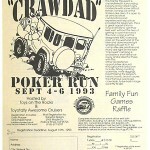 The Gold Lake Crawdad Poker Run took place until the late 1990s, when meeting Forest Service permitting requirements simply became more than Toys on the Rocks volunteers were willing to endure. The Toys on the Rocks chapter, which formed in 1983 and became a TLCA Chapter around 1985, played a huge role in TLCA during the 1990s, including leading roles in both Rubithon and the Thanksgiving Day Run. Initially focusing its efforts in support of CA4WD, the club removed the CA4WD membership requirement in 1993, as it could no longer support both CA4WD and TLCA. Toys on the Rocks President Jerry Shroeder noted, “TLCA has become an organization worthy of all our support.” The TLCA calendar was filled with various Toys on the Rocks club runs including Fordyce Trail, Deer Valley, Toyota Mountain Mania (which continued for a few years after Rubithon was initiated), Barrett Lake, and many, many more. 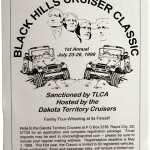 Late 1993 found the first listing in the TLCA calendar for a small event called the Dakota Challenge. 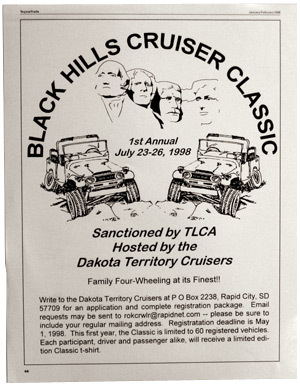 While not a TLCA Sanctioned event (yet), this would eventually help sow the seeds for a Dakotas based chapter and lead to another large and successful TLCA sanctioned event, the Black Hills Cruiser Classic, first hosted in 1997 by the Dakota Territory Cruisers. New events continued to develop after the surge of new chapters in 1992 and 1993. 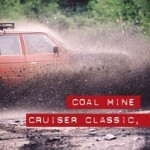 In May of 1994, Totally Land Cruisers of New Jersey announced their first sanctioned run, the Catamount Cruiser Challenge at the Mohawk Trail Region in Massachusetts, slated for September of 1994. Many TLCA members have fond memories of the Land Cruiser specific event—however, this led to a difference of opinion about attendance at TLCA Sanctioned events. Totally Land Cruisers of New Jersey was a Land Cruiser specific club and thus so was their event. This left some TLCA members questioning the Sanctioning of an event in which not all TLCA members could attend. TLCA did adopt bylaw changes later to allow vehicle specific events but the damage was already done and the CCC faded almost as quickly as it emerged. While this series of events was unfortunate, it did help define the term Sanctioned Event to mean that any and all active TLCA members were able to attend regardless of the vehicle they drove. 1995 found the first note in the TLCA calendar about an unofficial Moab, Utah, event. As with the Dakota Challenge, this too was not a TLCA run at the time. However, this informal run would eventually lead to another very successful TLCA Sanctioned event hosted by a TLCA chapter. 1996 saw TLCA mascot, Elsie the Armadillo, at the unofficial Moab event and Rising Sun first formally hosted Cruise Moab as a Sanctioned event in 1997. By 1997, the fervent pace of new chapters had settled down to a steady stream of approximately one or two additional chapters per year. 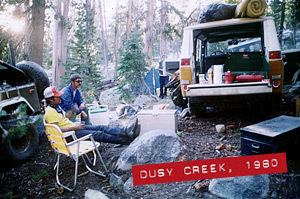 One of these chapters, added in 1997, was Pacific Mountain Cruisers. 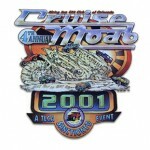 In 1998, PMC founding member Roger Taylor realized the primary event missing from the TLCA calendar was a Toyota specific Swap Meet, and thus was born PMC’s annual swap meet in Petaluma, California. In attendance for the second swap meet were Bob Garrett and George Rice themselves. The Swap Meet has continued to hold its own place on the TLCA calendar with the other premier events including GSMTR, Cruise Moab, Black Hills Cruiser Classic, Mud-N-Yer Eye Frolic, Glitter Gulch Gambol and Rubithon. PMC later added another event called the McGrew Trail Ride to join other new TLCA Sanctioned events, including the Coal Mine Cruiser Classic (hosted by the Gotham City Land Cruisers), the Razorback Ramble (hosted by the Razorback Land Cruisers), the River Shiver (hosted by the Rocky Mountain Land Cruiser Association) and the Lone Star Cruiser Roundup (hosted by Lone Star Land Cruisers). Today all TLCA members have an active calendar of TLCA Sanctioned events from which to choose. And if you look closely, included in TLCA’s calendar are small non-sanctioned events like the FJ45 Run and the annual Surf N Turf. So as the TLCA has evolved, so have TLCA events—and the two are now intimately dependant on one another. The success of the TLCA is dependant on the success of TLCA events, and vice-versa. Not a match made in heaven, but rather a match made on the trails.